Our practice became a member of the Chamber in January of this year, and the next month we opened the doors of our beautiful new office. The Chamber sponsored our ribbon-cutting ceremony in March, which took place at 118 Elm Street in Enfield in the Hannoush Jewelry Plaza. Dr. Elias Deros and the rest of our team are grateful that several other members of the Chamber took time out of their busy schedules to support us at the ceremony. We’d like to extend a special thanks to the Miller family and Shop Rite of Enfield. They provided delicious catering that helped make our event truly special. We’ve recently moved to a new office on Elm Street, but that doesn’t mean our team is new or lacking in experience. Some of our staff have known each other for close to two decades! We formerly operated in Somers in the old office of Dr. John Haserick. A few members of our team have previously worked here in Enfield in the former dental office of Drs. Glenn Toner and Dale Roberts. Of course, now we are all very excited to be working together and putting our talents and passion to use to care for the smiles in our community. Dr. Deros, the leader of our amazing team, is a Connecticut native. He grew up in Rocky Hill and earned his dental degree from The University of Connecticut School of Dental Medicine. Once he completed his general practice residency at Mountainside Hospital in Montclair, NJ, he returned to his roots. He has been practicing dentistry in Connecticut for about 24 years now. Since the doors to our new office opened in early February, we’ve maintained a schedule that is convenient for our patients. We’re open Monday through Friday, and we’re even open two Saturdays a month to accommodate folks who need weekend appointments. We offer all the general dentistry services your family might need, and we’re happy to care for patients of all ages, whether you’re bringing Baby in for their first checkup or it’s time for Great-Grandpa Joe to get his smile looked at. We also recognize that sometimes an emergency in Enfield might befall you, which is why Dr. Deros is always willing to accept after-hours calls to care for your urgent needs. In most cases, we can get you in for a same-day emergency appointment, and we do our best to perform same-day denture repair as well. We have a remarkable team of hygienists in our office, who perform cleanings, X-rays, and exams. If you need other services, such as sealants, fillings, crowns, bridges, or implants, Dr. Deros, Dr. Chimmiri, or Dr. Voukides will be there to help you. All of our doctors are also certified to provide Invisalign in Enfield; they even offer complimentary orthodontic consultations. We’re thrilled that our new office is finally open, and we’re looking forward to caring for all of your dental needs. As your general and cosmetic dentist in Enfield, we hope we can help you enjoy a smile that is both healthy and beautiful. We accept most insurances. 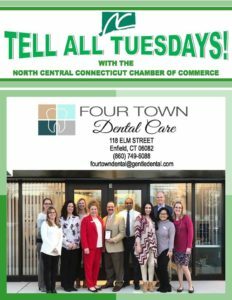 If you would like to schedule an appointment, please contact us at 860-749-6088 or Facebook us at www.facebook.com/fourtowndental.